Photo courtesy State Library of Western Australia. Apologies for leading with a cheap-shot Lucas joke, but you knew they were coming. After all, if a lighting and electrics automotive supplier best known by the totally unofficial slogan “Prince of Darkness” were to apply its technology to a malaise-era electric vehicle, wouldn’t that be the first thing on your mind too? While plenty of other automotive parts suppliers over the years either made or attempted to make the transition from supplier to full-fledged carmaker (see, for instance, Dodge), the British automotive electrics giant Lucas Industries for the most part stayed in its lane, expanding only to other automotive and aerospace components. It took the 1973 OPEC oil embargo, however, for then-75-year-old Lucas to break that long-standing tradition. While other companies and college engineering students tried out pretty much every exotic and alternative propulsion system known to man around this time, the folks at Lucas — who had already started converting Bedford vans for the British Post Office in London — decided to go with the relatively straightforward battery-electric vehicle setup, updated for the times. And they decided to build their electric car as a taxi. According to Geoffrey Harding, the then-head of Lucas’ electric vehicle program, the choice to build the electric car as a taxi boiled down to how much use it would get. “The economies of a car are not as good as those of a taxi largely because they don’t run as many miles in a year and an electric vehicle saves money when it runs miles,” he told an interviewer in 1977. To do so, the company contacted Letchworth-based Ogle, the company perhaps best known for the Mini-based fiberglass-bodied Ogle SX1000. While the SX1000 died with company founder David Ogle in 1962, the company continued as a design house and occasional coachbuilder, responsible for the design of the Bond Bug, Reliant Robin, and Reliant Scimitar. Lucas and Ogle engineers came up with a relatively compact scratchbuilt front-wheel-drive coil-sprung chassis on a 94-inch wheelbase that housed 18 batteries underneath the body so they could easily be swapped out (similar to the later Globe-Union Endura) and the entire drivetrain on a detachable subframe. To the chassis they mounted a fiberglass four-door body reportedly capable of carrying the same number of passengers as a contemporary Austin FX4 taxi, but with more luggage space. Overall, the cab weighed 4,800 pounds and measured 140.5 inches long, 69.5 inches wide, and 70 inches tall. “Externally, the vehicle is only a little longer than Mini Traveller, marginally less in width than a Jaguar, and it is approximately the same height as a London taxicab,” Reuters wrote at the time. While the batteries were of typical lead-acid design, Lucas engineers increased their performance to 13.6 watt-hours per pound over the then-typical 10-12 watt-hours per pound. Running through an SCR “chopper” controller and a 50-hp 216-volt motor, the drivetrain was good for a top speed of 60 mph and a range of about 100 miles. Nothing to write home about, but it worked using largely off-the-shelf components sourced from Lucas and its subsidiaries: CAV supplied the motor, Lucas the controller, and the regenerative braking system, and Girling the hydraulic backstop brakes. Photo courtesy British Motor Industry Heritage Trust. 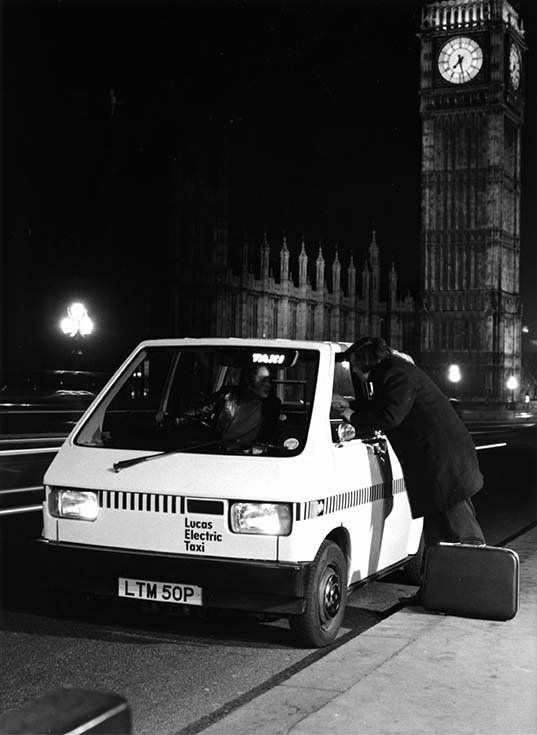 According to an October 1975 New Scientist brief on the taxi, it would have cost upwards of £5,000 at a time when internal-combustion taxis cost around £3,000, a price already considered exorbitant by taxi drivers. And although Lucas claims that the running and maintenance costs of electric cabs will be lower than diesel vehicles, cab drivers would have to pay for recharging points and probably a spare battery pack. This price differential would kill any introduction of electric taxis of the Lucas type unless the government decided that the quiet and clean operation of electric vehicles was worth backing by some tax advantage. 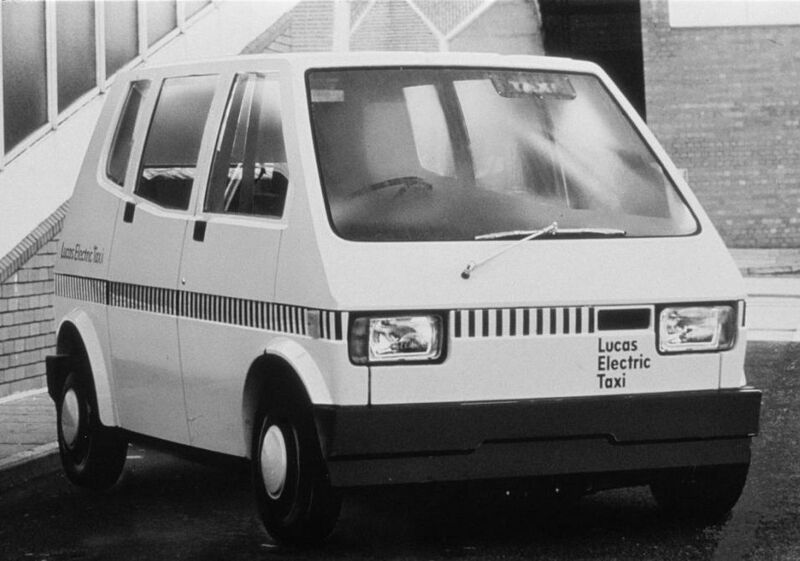 Lucas, unsurprisingly then, continued to convert Bedfords afterward, but dropped its electric taxi development. One of the prototypes still exists somewhere in England and appears to have recently sold to a collector.